Ah, April, my favorite month of the year! And it’s especially nice this month since we finally got some rain here in Austin, which led to insanely fast growth of everything in the garden and me finally getting a much-needed break from watering everything. In other news, I can now say that I garden with one hand tied behind my back. Yup, I managed to sprain my wrist pretty spectacularly. 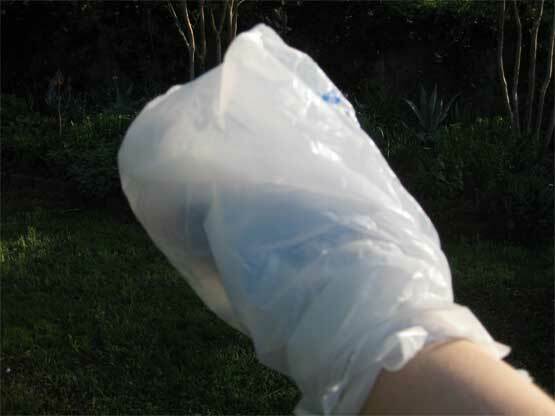 Sadly, the bag is pretty much there just to keep the brace clean– I’m under strict orders to keep that hand immobile, which is especially annoying because it’s my dominant hand…and it’s April in my garden and I have important things to do, *&&^$^$!!! So if I can’t work in the garden, at least I have something to look at. Now that it’s April, the roses have started blooming! I got around to my pruning pretty much on Valentine’s Day and was a little worried that would mean that everything would bloom late and be victims of a heat wave. Right now, the weather is perfect for the show. 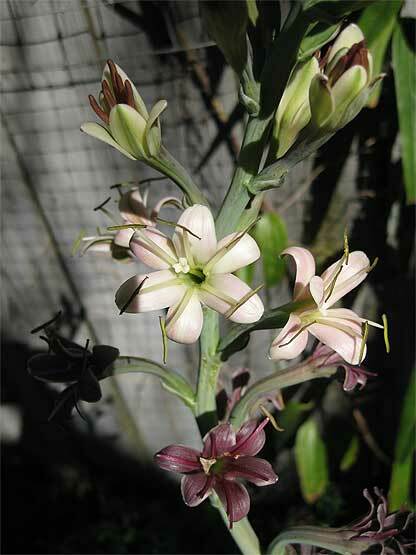 In a bit of serendipity, I noticed something a little odd when Maggie started blooming last week. Did the flowers spontaneously change color? Nope, that’s Belinda’s Dream up there at the top of the fence, rather than in front of Maggie where she’s supposed to be. Er, oops? Also blooming: Canna “Australia” planted against the house, pink Himalayan indigo, caryopteris, catmint, thyme, yaupon hollies, bulbine, verbenas, Mexican feathergrass, salvia greggii, Marilyn’s Choice abutilon, narcissus tazetta (planted very late), broccoli, snapdragons, and the last of the pansies. The bluebonnets are winding down and will be done within the next week or so, sadly, but they’ve had a good run. Have a great Bloom Day, everyone! Check out Carol’s post at May Dreams Gardens to see everyone’s GBBD posts. Wow, Lori! That shot of the filled-in back border is stunning proof of how much you’ve done in just a few years- not just with the roses but with the whole design. Madame Alfred looks wonderful but the Belinda-on-High is surprising. I’ve been looking at a 2-foot tall plant for over a year. Can she really get taller than a privacy fence! Uh, oh. Your garden is all the more amazing for the fact that it still looks this good even when you only have one non-dominant hand to maintain it with! 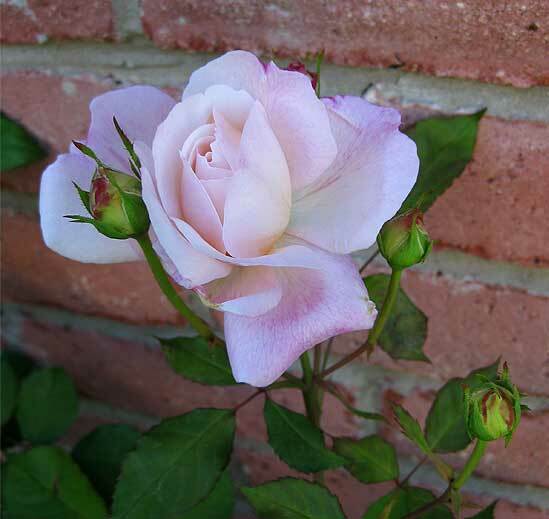 Roses are still pretty much a dream for us in the UK, so it is lovely to see so many perfect roses on your post today. Hope your hand heals quickly. Hey Lori — Sorry about your hand — do you need a hand? I could come do a little garden work with you one day if you’d like — just let me know. Your roses are just spectacular. I love the Gruss an Aachen, she’s so delicate. Your gardens are filling in so nicely and I loved seeing the long shot of the back bed. Take more like that and give us the tour! Argh–sorry to hear about the sprained wrist. That’s gotta put a damper on gardening. But you have a lot to show for all the work you’ve already done. I love the long shot–gorgeous! I love your roses! You have a lot of my favorites and they are just beautiful. Love the lighting on the Manfreda shot, and the back border looks wonderful. Lori, gorgeous roses, just gorgeous! I’m so sorry about the wrist. What a time for an injury! I hope you’ll follow doctor’s orders … I know how hard it is to do so, though. I found ways to garden even when I had a cast on my right leg. Not real prudent of me, huh? I think I need one of those native Manfredas, which would require a trip to Austin to peruse the nurseries there. Oh, no, don’t make me go to Austin … well, okay! Lori, welcome back to blogging land! Oh, your roses are something else. And you should take claim for the passalong Double Delight on my blog, too. Your garden is like a fairy-land of blooms right now. I think a visit is in order. Good work, oh magical one-handed wonder. The height of Belinda’s Dream surprised me too! 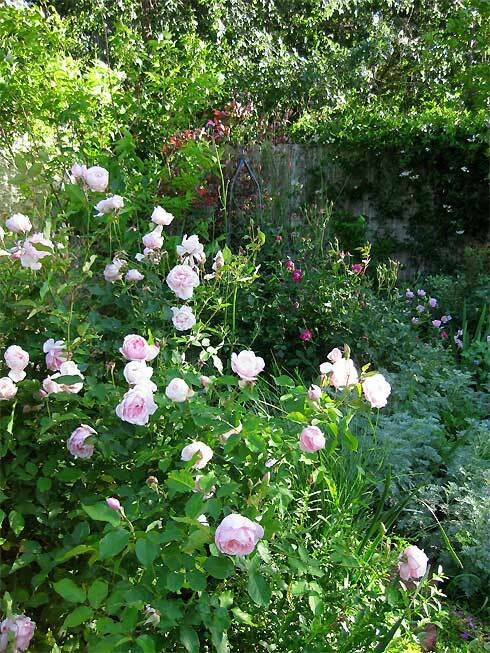 But I suspect that part of it is that that area is getting shadier, so the roses tend to get leggier. But I didn’t think that Maggie would make quite as good of a climber as she did, so who knows? I do fertilize regularly with the addition of some SuperThrive, so that might explain the height as well. Queerbychoice – Thanks! I do have to say that in the spots where I didn’t plant heavily, the weeds are trying their hardest to taunt me! Diana – I may take you up on that offer! Unfortunately, most of what I need to do involves heavy lifting and the hauling of large quantities of dirt, and those are not things I’m going to let my friends help me with. I’ve pretty much made peace with the fact that a lot of my projects are going to have to wait till fall. The worst casualty of the hand thing was the do-it-yourself Earthbox tomato planters I was working on. That project involved 10 Tupperware containers, PVC piping, and a bunch of power tools, and the poor tomato starts are dying a slow death because I haven’t been able to finish the containers to plant them! Pam – Oh, the hand thing is such a pain in the…hand. I’m just happy I got as much done as I did before it happened. It’s some consolation that I got all of the large plants moved that needed to be moved. Everything else can pretty much wait till fall if it has to. Sweet Bay – Thanks! I can see why these are all everyone’s favorites, even the ones that I was kinda “eh” about when I got them. Now that all of the roses have been in their current places for over a year, I’m finding they seem a lot healthier. And the backyard smells incredible right now. 😀 As for the Manfreda shot, I must have taken around 10 snaps and the one I posted was the only one that turned out! Cindy – I completely understand gardening even with a broken leg! Seriously, I can’t not do it. It drives me crazy to have to take it easy when it’s so nice outside and I see so much that still needs to be done! 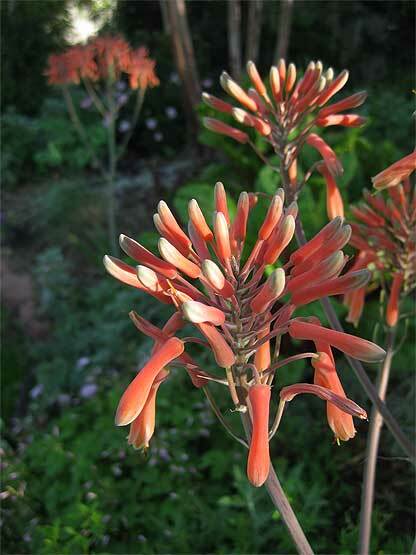 And when you come up to Austin to do some plant shopping, drop me a line so we can visit! I’m not too far from The Natural Gardener. Lori, your roses are amazing! 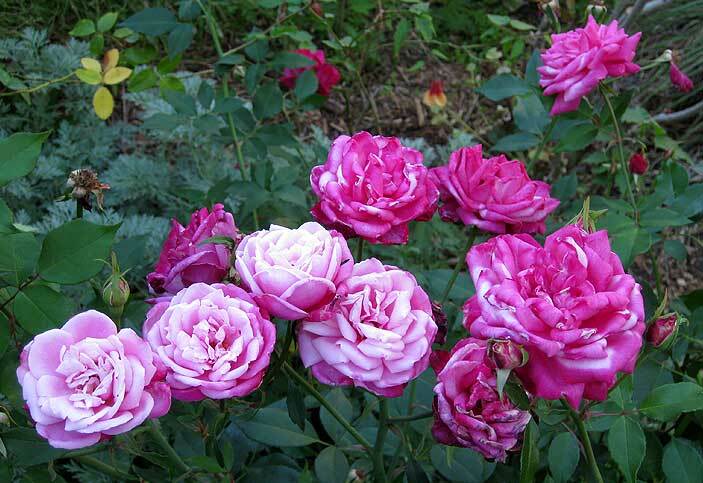 Judging by the list of roses, you must have a rose addiction–I think I have a plant addiction. So sorry to hear about your wrist. It sounds like you were lucky it didn’t break. What you need is a hunky gardener at your beck and call! 😉 Hope it heals fast, and you can get the brace off soon. Amazing Lori! I love the black tea flower and Datura is one of my favorites…I have the double purple frill type, but it’s slow growing this year…I hope your hand recovers soon! Your garden is so lush — inspirational, as I am just getting going in many places. 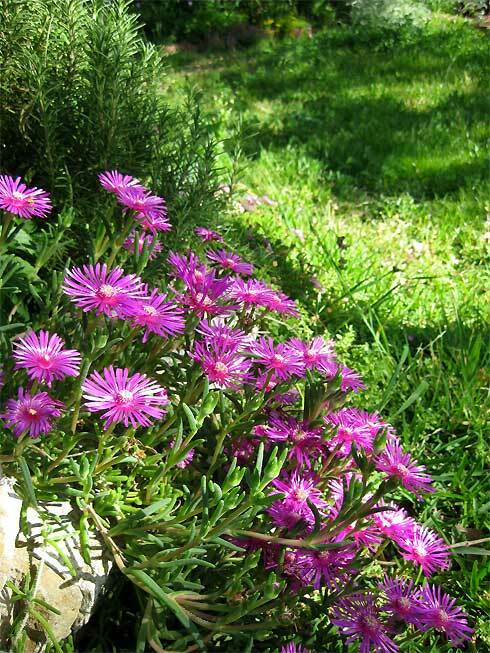 Also, which ones tend to bloom on through the summer at your place? Hope your wrist is on the mend. 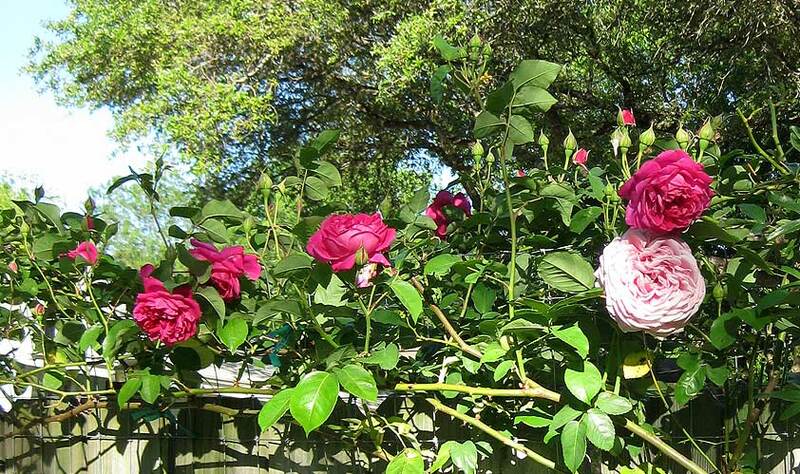 Morning Glories in Round Rock – Yes, I admit it, I do have a rose addiction. Last I counted, I had around 32 varieties. And I wish I had a hunky gardener at my beck and call, too! 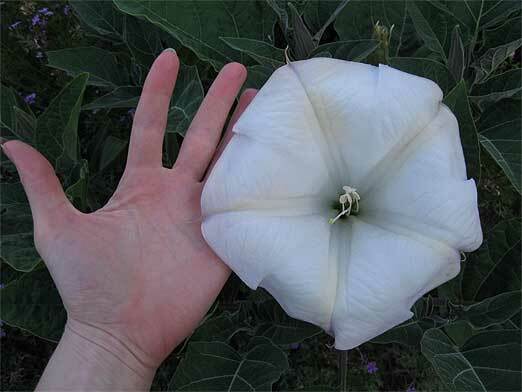 Conscious Gardener – I've seen the purple datura type in pictures from other Austinites, but I've never grown it myself. Want to do a seed swap in the fall? 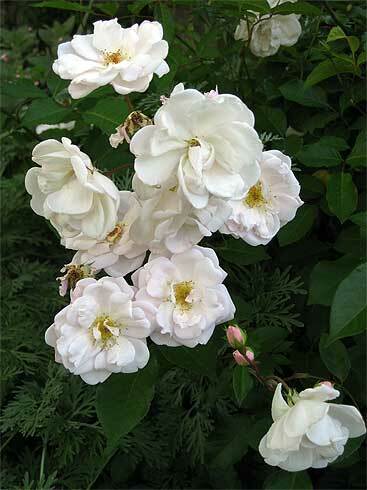 As for my favorite roses for cutting, I'd have to say my very favorite is Gruss an Aachen. And there's even more incentive to cut it when it blooms in the summer, since the heat fades out all of the subtle color variations within a few hours. I've had it last a week in a vase. 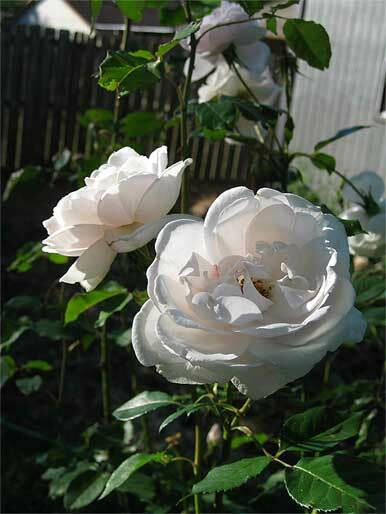 I also like Duchesse de Brabant for cutting, but I'll usually put it in a bud vase since the flower stems are droopy and I'd have to cut down to a much thicker part of the cane than I'm willing to do to get it to stand really upright in a vase, and boy, oh boy are those tiny thorns a pain. I like Souvenir de la Malmaison because mine sprawls and cutting lifts the flowers up to where I can comfortably smell them! Thomas Affleck is good in a vase as well, lots of strong, long stems for cutting and thornless too! I just wish it was scented. All of the English roses I've grown have sucked for cutting– they drop all their petals within the hour. I don't actually cut that many of my roses since the bushes are only now reaching a good size, and most of these I've mentioned were blooming when freezes threatened, so I had no excuse for not cutting them & bringing inside. Once I'm sure the bush is established, then I'll start cutting more and shall report back. As for summer bloomers, I'd say definitely Thomas Affleck, Duchesse de Brabant, the Knockouts, Gruss an Aachen, and Martha Gonzales. Marie Pavie tries, but I think she's in too much shade. Louis Philippe will put out a few flowers all summer long, but it's not a huge show. 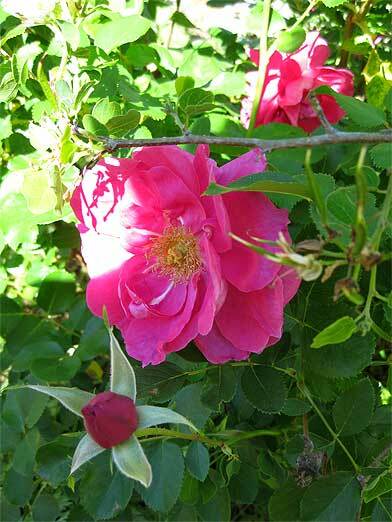 Some of my other roses get shaded out in the summer, so I suspect that's part of why they don't bloom. 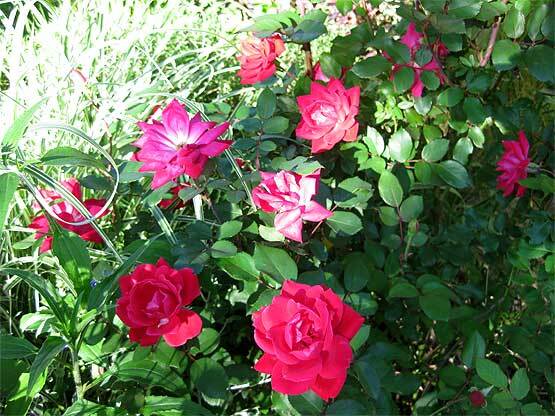 Also, I find that I need to water extra and fertilize to get a decent summer bloom for just about any rose except the Knockouts. I just planted a few more varieties that I'm hoping will bloom through the summer, so I'll have to get back to you on that. I have especially high hopes for Blush Noisette. Sadly, I have no easy tips for getting the color right when photographing the really hot-colored roses. If the color is way off and I really want to use the picture, I'll usually bug one of my roommates who's a Photoshop wizard and get him to tweak the color balance. I usually use ImageReady when I'm getting photos ready to post, and all I know is that you can't do it in ImageReady! Wow, what a lot of gorgeous roses! Your garden looks wonderful. I’m sorry you hurt your wrist. It is maddening to be sidelined during gardening prime time. Whoa! You got some serious roses growing. I really miss ‘Gruss an Aachen’. I’m going to have to find a sunny spot and buy a new one. Sorry about your wrist. This is a *bad* time of year to be without hands to garden. 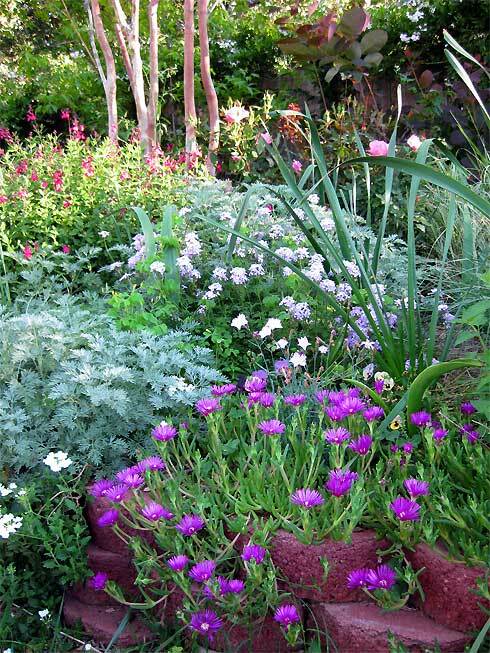 Lori, love the back border shot — lovely combination of colors and textures. And all I can say about your beautiful roses is WOW. Hi Lori! Rosalyn (stephanie) here 😉 haha…sorry I didn’t get a chance to say goodbye to you Monday night. What an amazingly beautiful garden you’ve created, great pictures!